This week I decided to go from the inside-out with this architecture project. I’m exploring what the interior may look like inside of the museum, trying to figure out how different architecture and lighting will feel, and how that will inform the outside structure. 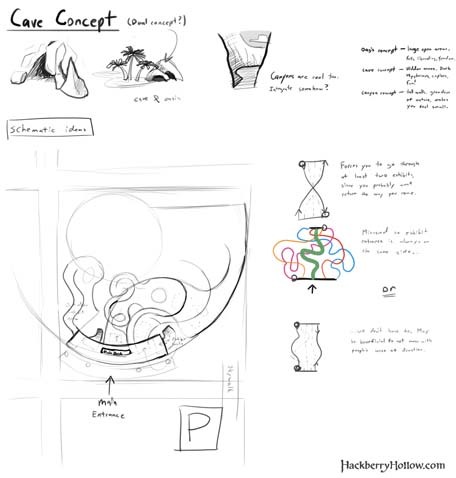 After doing some research, and watching Philip Dimitriadis talk about environment design at Animation Nation Night, I learned some cool stuff that helped take this museum design project in an interesting direction. 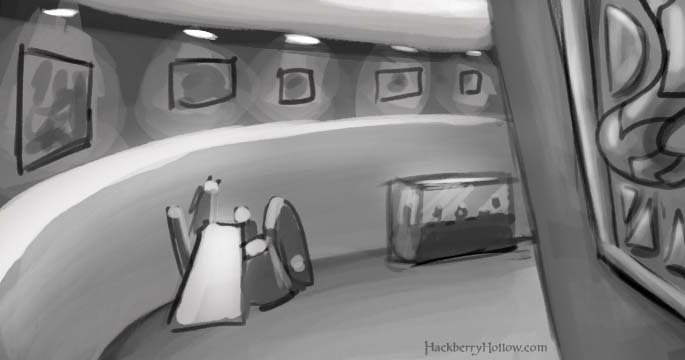 I started off with some really loose grayscale speedpaintings. I want to figure out mood just by lighting and architecture alone. I also wanted to make sure I integrated curves into the architecture so that there will automatically be curves in the scene compositions (which is something that you always want to shoot for when doing layout). It also helped reinforce the mimicking nature theme of the architecture. So, after reading some stuff on architecture design (in particular architypes.net), there were two concepts I wanted to explore for the museum: large liberating spaces and mysterious spaces. I’m not sure if the entire museum would be open like that. It would be very stale. So I tried something more dramatic, using the mystery concept, where the path zig-zags and you can’t quite see what’s around the bend. Very cool, but I can’t see the entire museum being like that either. “Well, duh!” I thought, “That’s because good architecture has variations of spaces. Think about your trip to that one science museum…that…I can’t quite remember what the name of it was exactly, but yeah, that building was a good example.” Anyway, I broke it down into three concepts that all have to do with the natural environment where the museum is located: oasis (big, open and liberating), caves (mysterious, adventurous, and fun), and canyons (makes you feel small compared to the grandeur of nature). So I went off in that direction, making an extreeeeeemly rough floor plan, exploring how each exhibit can progress through the cave, canyon and to the open oasis architectural themes. I do want the circulation of people through the exhibits to be controlled so they can go through it somewhat sequentially. I remember going to The Metropolitan Museum of Art and being somewhat annoyed that it was hard to navigate, but I don’t want to pull a Guggenheim where you have to go through the whole thing (this museum is a lot bigger than the Guggenheim anyway). I had the idea of making the main entrance of the museum a nexus of all the exhibits. 5 entries to the 5 paths of the museum. 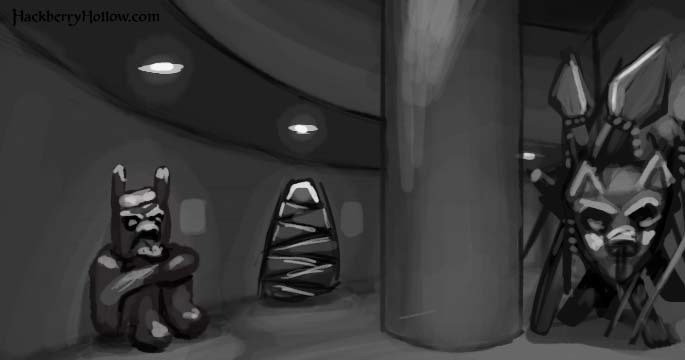 (Two of the paths go directly underground, and they are heavier on the mystery concept.) When you get to the end of the exhibit you have another smaller nexus that allows you to head back through a different exhibit. That way you can return to the main entrance without backtracking through the same exhibit. This of course would mean that the exhibit designers will have to account for two points of entry, but what I do I care. I’m pretending to be a pretentious architect. It’s not going to be my problem! The fifth path I’m thinking about turning into an outdoor exhibit area, a garden, a place where fancy events can be held. The client really wanted Leopard Corbusier to add something like that. Even though Ferret Gehry didn’t win the bid, they really liked the outdoor garden he did for the Walrus Disney Concert Hall. (Yes, I’m going to milk the animal puns for all it’s worth.) 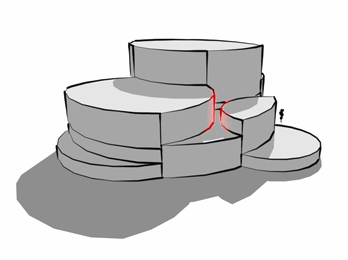 The outdoor area will also let me do some more canyon-like themes, bring it back to where I originally got the idea of the canyon architectural concept: a shape created by accident in Sketchup, marked in red on the right.